Welcome to Open Access Week 2017. The Office of Scholarly Communication at Cambridge is celebrating with a series of blog posts, announcements and events. In today’s blog post we revisit the question about the openness of Cambridge. For Open Access week last year I looked at how open Cambridge was using the extremely useful Lantern tool, developed by Cottage Labs, and which is the basis of the Wellcome Trust’s compliance tool. If you haven’t used it before, Lantern takes a list of DOIs, PMIDs, or PMCIDs and runs these through a variety of sources to try and determine the Open Access status of the publication. I found that, for publications in 2015, 51.8% of all of Cambridge’s research publications were available in at least one ‘Open Access’ source. How did Cambridge’s 2016 publications fair? Read on to find out. Using the same method as last year, I first obtained a list of DOIs from Web of Science (n=9416) and Scopus (n=9124) for articles, proceedings papers and reviews published in 2016. Combining and deduplicating these lists returned 10,674 unique DOIs (~29 publications/day). I also refreshed the 2015 publication data using the latest Web of Science and Scopus information, which returned 10,090 unique DOIs. Year-on-year, this represents a 5.8% increase in the total number of publications attributable to Cambridge – more than inflation! The deduplicated DOI lists for 2015 and 2016 (20,764 DOIs in total) were fed into Lantern and analysed in combination with information from Web of Science and the University’s institutional repository Apollo. Figure 1. Distribution of papers, published in 2015 and 2016 which have a DOI, according to the Open Access sources they can be found in. 57.5% of 2016’s articles appear in at least one Open Access source, which represents a 4% increase over 2015. 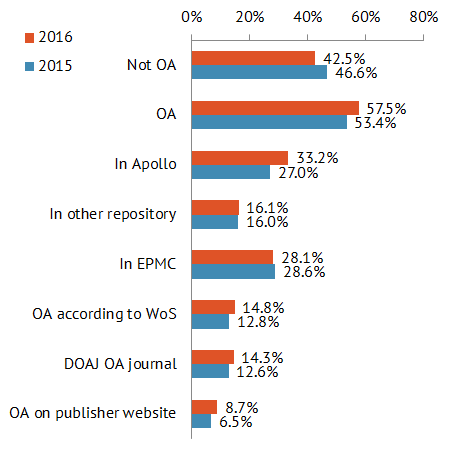 One third of all papers published in 2016 are available in Apollo. Very pleasingly the percentage of publications available in at least one Open Access source increased to 57.5% in 2016 compared to only 53.4% for 2015 publications. Given that the total number of publications also increased during this period this result is doubly exciting. In raw numbers, this means that while 5384 publications were Open Access in 2015, an impressive 6135 publications were made Open Access in 2016. Most of this increase can be attributed to the much larger share of publications that appear in Apollo, which is now the largest source of Open Access material for the University of Cambridge. An additional 822 publications were deposited in Apollo in 2016 compared to 2015, which is a 30% increase in one year alone. You can now find more of the University’s research outputs in Apollo than in any other Open Access source. And because we operate an extremely popular Request a Copy service, potentially all of the publications held in Apollo, even those that are restricted and under embargo, are available to anyone in the world. You just need to ask.